FastSeas is a weather routing and passage planning tool. It will calculate the fastest route to take you from point A to point B given the current NOAA GFS weather forecast , current oceanic currents , the performance of your vessel, and your comfort criteria. Feel free to look around, but before you can actually run routing calculations, you'll need to log in. Logging in allows FastSeas to remember your polar and comfort criteria. You can log in using various social login options. I have taken this approach rather than having you register with a username and password because it's less work for me and safer for you - as I don't have to deal with passwords. There is nothing nefarious going on here. FastSeas is not going to be reading your posts or creating posts or any such thing. You need to teach FastSeas about the performance of your vessel. You do that using the Vessel Performance tab. You only have to setup these performance settings once. FastSeas will save these settings and use them next time you come back. There are instructions on the Vessel Performance tab, so I won't repeat them here. The amount of data you have to enter on the Vessel Performance tab can look intimidating, but it goes pretty quickly. Before FastSeas can calculate a route, you need to tell it where you are starting from and what your destination is. You do that using the Routing tab. On the Routing tab, you'll see a map with an "S" marker and a "F" marker. These represent your start and finish points. They can be positioned by dragging them on the map. Or if you prefer, you can enter the Lat & Long into the fields. You can now run weather routing calculations by clicking the Calculate Route button on the Routing tab. After the calculation is complete, the route will be displayed on the map. You can also look at the details of the route on the Route Positions tab, and summary stats on the Passage Stats tab. You can specify your comfort criteria on the Routing tab. You can enter the maximum wind speed in knots that you are willing to tolerate beating (forward of the beam), reaching (aft of the beam), and maximum gust conditions. Note that you can run multiple calculations, perhaps with different departure times, comfort criteria, or destinations, and have all of these routes displayed in the same map. You can also get routing and departure planning solutions from FastSeas via email (e.g. Iridium GO!, Sailmail, Winlink, and other email services) and via Garmin/DeLorme inReach devices. This is particularly useful when offshore or in remote anchorages - when you don't have access to high-speed internet. Results are provided by an automated email responder, which automatically calculates the route or departure planning result in response to your emailed request, and sends the result back to you in a reply email within a few seconds. Using the email responder service requires a FastSeas subscription. Where 12-0N is 12 degrees 0 minutes North, and 68-18W is 68 degrees 18 minutes West. A few minutes after sending your email, the automated email responder will send you a reply containing a Google Earth KMZ file which contains your routing solution. Each of the pushpins in the solution can be double-clicked to see the routing details at that point of the passage. The automated email responder will respond to the email address you registered with, or to any email account you setup in the Account tab - where you can authorize your Winlink, Sailmail, and Iridium email addresses. The KMZ file is typically very small (2-3 KB) and therefore very suitable for low bandwidth HF or satellite acccess. GPX files are larger. If you would like to receive a compressed GPX file (zipped), then use a GPXZIP switch instead. The default departure time for routing request submitted via the email responder in "now." You can adjust the departure time using the optional DEPARTURE_DELAY_HOURS parameter. For example, use DEPARTURE_DELAY_HOURS=2 to set the departure time to two hours from now; or use DEPARTURE_DELAY_HOURS=24 to set the departure time to this time tomorrow (24 hours from now). You can optionally include parameters to adjust your comfort criteria. To set the maximum wind you are willing to tolerate forward of the beam, use MAX_WIND_BEATING=20 (e.g. 20 kn). Use MAX_WIND_REACHING=30 to set the maximum wind you are willing to tolerate aft of the beam. Use MAX_WIND_GUST=50 to set the maximum wind gust you are willing to tolerate. If you would like to disable ocean current effects in the routing calculation, add a NO_CURRENT switch to your request. You can also optionally include parameters to adjust your polar performance and motoring criteria. To set the polar performance adjustment, use PERFORMANCE_ADJUSTMENT=90 (e.g. 90%). Use START_MOTORING=3 (e.g. 3 kn) to set the boat speed at which you will start motoring. Use MOTORING_SPEED=7 (e.g. 7 kn) to set the speed at which you motor. The FastSeas email responder also supports Garmin/DeLorme inReach devices. Messages to inReach devices are limited to 160 characters of plain text - and so this imposes some limitations on what FastSeas can send. InReach devices automatically provide your current location in all messages sent from the device, so there is no need to provide your current/start position latitude and longitude when submitting routing and departure planning requests from your inReach device. In you wish to specify a departure position different from the position automatically reported by you inReach device, then you certainly may include both departure and destination positions in your request. When sending a request from an inReach device, you must include the EMAIL parameter, specifying the email address you registered with (see the Account tab). This is required because messages from inReach devices do not provide a reply email address. H0 Indicates the elapsed time in hours to reach the waypoint. H0 is the start point, now, at hour 0; H6 is 6 hours from now, etc. The example request above will send 24 waypoints with 4 hour interval between each waypoint. If you request more data than can fit in a single 160 character message, then FastSeas will reply with multiple messages. The example request above will result in a chain of 6 messages being sent in reply. You have 5 free routing requests remaining this month. If you need to make more routing requests, please purchase a subscription. A polar diagram is a common way of depicting vessel performance in various wind conditions. The diagram plots boat speed at various true wind angles and wind speeds. The true wind angle is indicated around the edge of the semicircle. Boat speed is then plotted at various true wind speeds - different color lines representing different true wind speeds. The boat speed is indicated as the distance from the center of the circle. Concentric circles indicate boat speed starting at zero in the center of the circle and extending out at 2, 4, 6, 8, and 10 knots boat speed. You can create a simple polar diagram for your vessel by providing the waterline length (LWL) and closest point of sail (this is half of what you tack through) below. Click the "Create" button and FastSeas will generate a simple polar diagram from these two data points. You can can then refine the resulting polar diagram by selecting the Edit option below. You can create a simple polar diagram for your vessel by providing the waterline length (LWL). Click the "Create" button and FastSeas will generate a simple polar diagram from the provided LWL. You can can then refine the resulting polar diagram by selecting the Edit option below. Edit the polar diagram for your vessel by entering boat speed values in the table below. In this table there are four columns for different true wind angles. True wind angles measure the direction of the win relevant to the bow of the vessel. A true wind angle of 0° represents wind coming directly from the bow, and 180° represents wind coming directly from the stern. Sailing vessels should enter the closest point of sail in the first column header. The table has six rows for different true wind speeds (5, 10, 15, 20, 25, 30 knots). In each cell in the table, enter your boat's speed in knots for the given true wind angle and true wind speed. The polar diagram will be automatically updated as you enter this data. Your polar will be automatically saved in your account for reuse on your next visit. Use this option to import a polar created elsewhere; or to create a more complex polar than is possible using the Edit option above; or to export and save your polar for safe-keeping or for re-use in some other routing application. Paste your qtVlm , OpenCpn , or iPolar formatted polar data in the window below and click the Import button. Departure planning will calculate estimated route statistics based on the departure date/time, start location, and finish location that you configure on the Routing tab. It will calculate these stats on one day departure intervals starting with the departure date you specify on the Routing tab. These stats are rough estimates and intended for comparison of potential departure dates. You have 5 free departure planning requests remaining this month. If you need to make more departure planning requests, please purchase a subscription. FastSeas will not avoid reefs or other navigational hazards. Use real charts and your eyeballs for that. FastSeas will not keep you safe from localized weather phenomena (squalls, waterspouts, etc.). FastSeas will not keep you safe from cyclones/hurricanes. FastSeas will not keep you safe from piracy risks. Every Captain is responsible for the safety of their own vessel and crew. FastSeas is no substitute. All data presented by FastSeas is generated by computer models subject to error and deviation from reality. Use at your own risk. You have imported custom polar data. If you edit it here, your imported polar data will be modified and likely significantly simplified in order to fit the data entry screen. When switching between "Sail" and "Power", FastSeas will generate a new "Simple" polar and your existing polar will be replaced/lost. Click "Confirm" below to cancel your FastSeas subscription. Cancellation will be effective at the end of your current billing period on . Your subscription is now active. Your subscription renewal date is . FastSeas is a sailing passage planning tool. 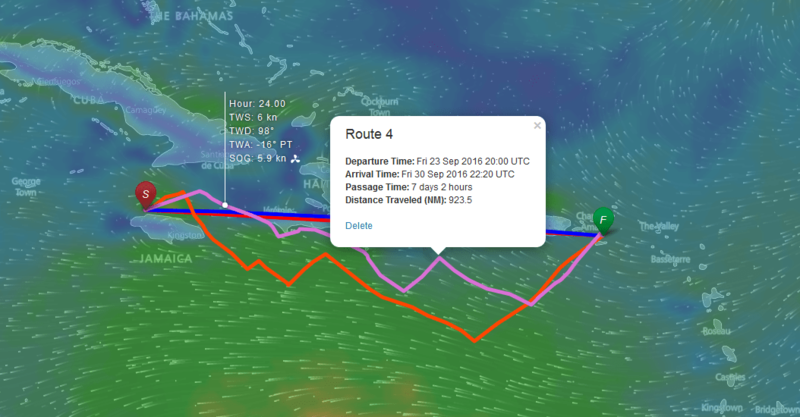 It will calculate the fastest route to take you from point A to point B given the current NOAA GFS weather forecast , current oceanic currents , the performance of your vessel, and your comfort criteria. FastSeas is created by Jeremy Waters. 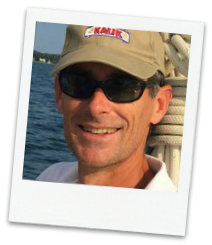 Jeremy is a lifelong sailor with extensive cruising experience spanning the Western Mediterranean (Costa del Sol, Balearics, Algeria), Eastern Caribbean (Virgin Islands through Trinidad, Venezuela, and Bonaire), throughout The Bahamas, US The US Gulf and East coasts (Florida through Chesapeake), and a transatlantic. If you have feedback, suggestions or questions, please email them to me. What weather forecast does FastSeas use? FastSeas uses the latest NOAA GFS model data when calculating routes. Forecast data for the next 16 days is used in the calculation. Does FastSeas consider the affects of current in calculating the best route? Yes, FastSeas uses the latest available NOAA OSCAR ocean current data when calculating routes. The routing algorithm will automatically route you through areas of beneficial current, and avoid areas of contrary current. When are the GFS forecasts updated? When is OSCAR data updated? NOAA publishes OSCAR data every 5 days. How does FastSeas calculate passages that exceed the forecast duration? When the voyage duration exceeds the forecast duration, FastSeas continues to calculate the voyage using the last available weather forecast data. FastSeas will display warnings in the results and plot this extended portion of the voyage with a dashed line.